Hummus (chickpeas, lemon juice, olive oil, garlic, pepper and tahini), reduced fat tzatziki (reduced fat yoghurt, cucumber and garlic dip), vegetable based dips, salsa. Pesto, low fat mayonnaise, sweet chilli sauce. Cranberry sauce, gherkin spread, chutney, mustard. Low fat cream cheese, cottage cheese, ricotta. Zebra sanga: 1 slice of white, 2 slices of wholemeal, rye or grain. This is a great way to increase consumption of wholemeal/grainy bread. Pinwheel or sushi sandwich: Spread a slice of bread with filling (e.g. avocado), roll up, cut in half and display with the filling showing. Triple decker: multilayered sandwich (3 slices of bread, 2 different fillings per layer). Vary sandwiches, fillings and spreads to give more food variety and choice. Try different types of bread, such as wholemeal, grainy, seeded bread, rye, sour dough, fruit bread, rolls, mini rolls, wraps, pita, focaccia, Lebanese and lavash breads. Use poly- or mono-unsaturated margarine instead of butter. Spread sparingly, if at all. Offer toasted sandwiches and wraps, or hot rolls. Wrap sandwiches immediately after being made to stop the bread drying out. Pat dry moist ingredients, such as tomato or pineapple, and place between dry ingredients/spreads to help stop the bread turning soggy. Always try to include a protein source such as egg, lean meats, fish, reduced fat cheese or legumes (hummus dip, lentil pattie, Mexican style kidney beans). Always try to include at least one vegetable or fruit filling. Use lean meats and reduced fat cheeses. Cut sandwiches into different shapes and sizes, e.g. four triangles for smaller appetites or ‘triple decker’ for older students. Keep in mind that younger students only have little hands - Try mini dinner rolls. Use leftover bread to make up toasties. Name healthy sandwiches with catchy titles, like ‘Chomping Chicken Burger’, or after popular themes like ‘Bart Simpson’s BLT’ to help add to their popularity. Lean ham, reduced fat cheese, tomato and chutney or salsa. Roast chicken (no skin) and coleslaw (low fat dressing). Roast chicken (no skin), cucumber, lettuce and reduced fat tzatziki or avocado. Roast chicken (no skin), avocado, lettuce and alfalfa. Tuna (in spring water), corn kernels, grated vegetables and sauce (salsa, chutney, low fat mayonnaise). Tuna (in spring water), salad, and reduced fat cheese. Roast beef, salad (lettuce, tomato, grated carrot, cucumber) and mustard. Turkey, spinach, tomato and low fat mayo. Roasted chicken (no skin), pesto and char-grilled capsicum. Salmon (in spring water), spinach, spring onion, low fat mayo and reduced fat Swiss cheese. Mashed egg, salad and low fat mayonnaise. Baked beans and grated reduced fat cheese (toasted). Reduced fat cheese, salad and hummus. Grated reduced fat cheese, avocado and lettuce. Reduced fat ricotta, banana, currents, cinnamon and honey. Reduced fat cheese/ricotta, grated carrot and sultanas. Banana, tahini and honey or cinnamon. B.L.T. : Bacon (lean and cooked), lettuce and tomato. Tropicana: Lean ham, reduced fat cheese, tomato and crushed pineapple (drain well). Mexicana: Baked beans, grated reduced fat cheese (toasted) and salsa. Meatball Lovers: Sliced meatballs in tomato pasta sauce, reduced fat cheese and spinach. Souvlaki: Lean chicken/mince patties or lamb, salad and reduced fat tzatziki served in pita bread. 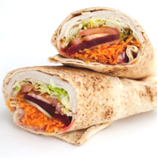 Falafel Wraps (falafel mix can be purchased commercially and is quick and inexpensive to prepare): Salad and reduced fat tzatziki or hummus served in a wrap. Christmas Lovers: Lean ham or turkey, roast vegetables and cranberry sauce. The Aussie: Roast beef, beetroot, reduced fat cheese, pineapple and salad. Italian Veggie Patch: Pesto, char-grilled zucchini, char-grilled eggplant, reduced fat feta and spinach. Reuben: Corned beef, low fat coleslaw and Swiss cheese. We ‘buy with our eyes’, so creative presentation is important. It’s worth the effort as it will attract students to make a healthy choice, which in turn will increase sales of healthy food. Where possible choose reduced fat, reduced salt, and/or no added sugar varieties of products. When selecting commercially made food and drink products, remember to check their nutrition information panel against the ‘Nutrient criteria for occasionally foods’ table in the Healthy Canteen Kit - Food Planner.